In this collection of essays, nationally known science writers Deborah Blum, Mary Knudson, and Robin Marantz Henig assemble the best science writers working today to explain what they do and how to do it well. Field Guide combines detailed and practical how-to advice with thoughtful discussions of the challenges of science journalism in the 21st century. It doesn't shy away from addressing such controversial matters as cloning, stem cell research, eugenics, medical overtreatment, and questions of scientific honesty. Offering a comprehensive overview of the field of science writing, this book discusses a broad range of media and sources, from newspapers to broadcast journalism and from corporations to government agencies. It also provides a detailed analysis of some of the hottest fields in science writing — ranging from mental health to human genetics — and covers a diverse array of writing styles, from "gee-whiz" to investigative. 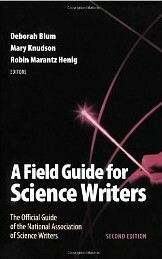 With more than 45 esteemed contributors — people who work for such leading news outlets as Scientific American, Popular Science, Discover, Smithsonian, The New York Times, and The Wall Street Journal — this book is an invaluable resource for current and aspiring science writers, students and instructors in science writing and journalism, and scientists who are interested in science communication. Take a look at the Table of Contents below. Order the book via Amazon.com using this link.